In the 11-and-a-half years of running this website, I had never had any reason to mention ubiquitous 1980s movie actor Steve Guttenberg. Now for the second time in two weeks I have the privilege of making reference to The Guttes. The first time was when I speculated why the infomercial for the creepy talking dog movie Heidi 4 Paws did not tout Steve Guttenberg as one of its stars, even though he did voiceover work for the film. The producers of the Total Gym infomercial did not make the same mistake. Sure, Steve is not the host of the infomercial; that honor still goes to supermodel Christy Brinkley and trite-Internet-meme star Chuck Norris. 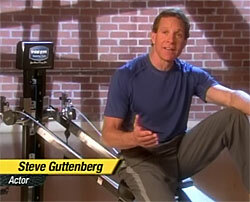 But one of the customer testimonials for the home gym features none other than Mr. Steve Guttenberg. It is not clear why having the lead actor of Police Academy, Cocoon, Police Academy 2, Short Circuit, Three Men and a Baby, Police Academy 3, Can’t Stop the Music, Three Men and a Little Lady, and Police Academy 4 (but not 5) vouch for a piece of fitness equipment would make anyone more likely to purchase it. But there he is telling us how excited he was to try the TotalGym after hearing so much about it from his father, a former U.S. Army Ranger and NYPD cop. He then goes on tell us how convenient and efficient he found the Total Gym. Length of Steve Guttenberg’s star turn in this television extravaganza: 45 seconds. All day long at gyms across the country, you will see guys hard at work trying to get what everyone calls the “Steve Guttenberg body.” Now all those men who long to be as buff as Guttenberg can just buy the Total Gym!